IBT’s On-Site Belt Services Group can offer belt splice vulcanization up to 72″ width. In addition to vulcanization, our Belt Services Group provides belt repairs, lagging, lacing, belt cleaner installation, belt tracking and troubleshooting, and conveyor system surveys. Belt cover gauge wear analysis is also available for select customers, this helps identify budgetary needs for upcoming belt replacements. AB Splice — Non-ferrous bronze metal of very high tensile strength, rated for belts up to 800 PIW, non-sparking, non-corroding and non-rusting. Bronze color. Durasplice — Ferrous galvanized cast iron of very high tensile strength. Rated for belts up to 800 PIW. Silver color. Non-sparking Everdur, Stainless Steel, Galvanized, Megaloy and Mild Steel plate fasteners. Mechanical lace — Installed or sold by the box, we also offer to prepare the belt ends for plate fasteners. Special treatments include: recessed lace, cover flaps, hidden lace. Slitting and cutting — We slit to any width and cut to any length while maintaining industry standard tolerances. Cleats — Many different cleat configurations can be added to our PVC belt. Standard T-cleats and beefy cleats range from half-inch up to 3-inch height and can be notched, tapered, or welded in individual segments. V-guide profile lugs are also available in several sizes. V-Guides — We stock all of the common PVC and Urethane V-guide profiles in both solid and notched options. They can be welded to the pulley side as a single centered guide or in multiples. V-guide profiles can also be used as edge flanges when welded to the cover side. Vulcanized Endless Splicing — Vulcanized Splicing functions as an alternative to mechanical fasteners. Varieties include: step splice, finger splice, double finger splice, finger overlap, skived splice or with ends prepared for field splice. Perforation — Perforation available for bolts, vacuum or drainage. 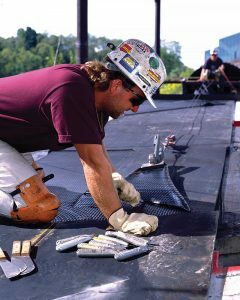 Backing — Types of backing include natural rubber, neoprene, Linatex, Rema, closed cell foam or wetsuit and can be chemically bonded to flat belting, timing or V-belts. We can also groove or sipe for greater flexibility. The IBT IRPG Group has a skilled belt services team that custom-fabricates and services conveyor belts every day—both heavyweight and lightweight—for all types of industries. They also cut and crimp a wide variety of industrial hydraulic and pneumatic hose at our KC Hose Shop facility, which is STAR-certified facility, exceeding criteria for cleanliness and hose safety. We’ve got the inventory and expertise to service all your belting and hose needs. For more information, contact Tim West, IBT’s Industrial Rubber Product Group Director, today!